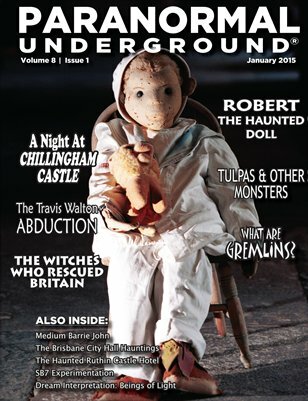 In this issue of Paranormal Underground magazine, we spotlight medium Barrie John, Robert the Doll author David L. Sloan, and Melissa Martin Ellis, author of The Everything Gost Hunting Book. We also feature the haunted Ruthin Castle Hotel, the Travis Walton Abduction, an SB7 experiment, the tulpa phenomenon, the ningen cryptid, a night at Chillingham Castle, and the witches who rescued Britain. Other columns cover metaphysics, dream interpretation, magic and lore, paranormal safety. For a 12-month PDF subscription to Paranormal Underground magazine, visit www.paranormalunderground.net!